After just one week in theaters around the globe, New Line Cinema's Annabelle: Creation has taken in more than $110 million, not only opening in the #1 spot in numerous markets, including North America, but quickly boosting filmmaker James Wan and producer Peter Safran's Conjuring universe of films over the $1 billion mark at the worldwide box office. The announcement was made today by Sue Kroll, President, Worldwide Marketing and Distribution, Warner Bros. Pictures. Here's what she had to say in a statement. "We are thrilled with the success of Annabelle: Creation and enormously proud to continue bringing this hugely popular Conjuring franchise to theaters everywhere. We congratulate our colleagues at New Line Cinema, our astute marketing and distribution teams, and everyone who put their collective creative energies together to tell such wonderfully frightening stories for movie audiences around the world to enjoy." In addition to opening in the #1 spot in the U.S. and Canada, Annabelle: Creation scored the highest industry opening weekend of all time for a horror film in numerous international markets: Indonesia, Malaysia, Singapore, Vietnam, Sweden, Poland, Portugal, Czech Republic, Serbia, Slovakia and Hungary. It had the highest opening weekend grosses of all films in the Conjuring universe in 26 international markets, including Korea, Indonesia, Russia, Eastern Europe and Scandinavia. The film dominated the Asian box office by ranking #1 in seven of eight opening markets there, out-grossing all comparable films regionally, and has already surpassed Annabelle's lifetime cume in Portugal, Poland, Russia and Hong Kong, and both Annabelle's and The Conjuring's total cumes in Korea, Thailand and Vietnam. It currently ranks #1 in ten of the 11 markets that opened yesterday, including Mexico, Brazil and UAE, and is already dominating those markets, with Mexico and three other Latin American markets, as well as UAE, showing the highest opening days ever for a horror film in those territories based on the Thursday box office alone. Here's what Toby Emmerich, President and Chief Content Officer, Warner Bros. Pictures Group, had to say in his statement. "This year marks the 50th anniversary of the founding of New Line, and without question the horror genre has always been an integral and important part of the company's DNA. While the genre has certainly evolved over the decades, watching the critical and commercial success of the Conjuring universe has been truly spectacular and I am incredibly proud of all the talented people involved in making this happen." 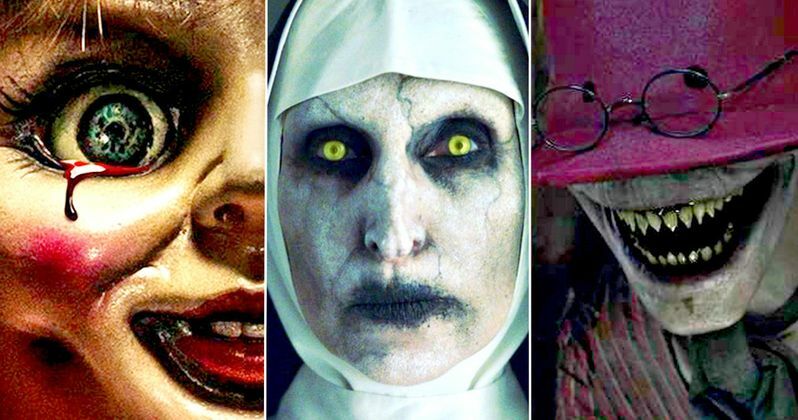 Individually, several of the films that make up the New Line horror-verse are among the top all-time earners at the box office, with the The Conjuring 2 and The Conjuring coming in second and third in the genre, respectively, after The Exorcist, and Annabelle at number eight. The worldwide theatrical grosses for the films stand as: The Conjuring 2 at $320,373,500; The Conjuring at $319,482,193; and Annabelle at $257,047,661. Here's what New Line's Richard Brener, President, Production, and Carolyn Blackwood, President, Content, Strategy & Operations, had to say in their joint statement. "James Wan has a proven ability to tap into the minds of horror fans in a way few can. To reach this benchmark with just four films is truly remarkable. On behalf of everyone at New Line, we couldn't be more excited for him, producer Peter Safran, and all the filmmakers who were so instrumental in making each of these movies so successful." Next up in the New Line series is The Nun, based on the character appearing in The Conjuring 2, directed by Corin Hardy, and due in theaters July 13, 2018. The studio is also in active development with Atomic Monster and The Safran Company on The Conjuring 3 and The Crooked Man, the latter also drawn on the character appearing in The Conjuring 2. In Annabelle: Creation, several years after the tragic death of their little girl, a doll maker and his wife welcome a nun and six girls from a shuttered orphanage into their home. They soon become the target of the doll maker's possessed creation, Annabelle. David F. Sandberg (Lights Out) directed from a screenplay by Gary Dauberman, who also wrote Annabelle. Peter Safran and James Wan produced the film, which stars Stephanie Sigman (Spectre), Talitha Bateman (The 5th Wave, upcoming Geostorm), Lulu Wilson (Ouija: Origin of Evil, Deliver Us from Evil), Philippa Coulthard (After the Dark), Grace Fulton (Badland), Lou Lou Safran (The Choice), Samara Lee (Foxcatcher, The Last Witch Hunter), and Tayler Buck in her feature film debut, with Anthony LaPaglia (TV's Without a Trace) and Miranda Otto (Showtime's Homeland, The Lord of the Rings Trilogy). Serving as executive producers on Annabelle: Creation were Richard Brener, Walter Hamada, Dave Neustadter and Hans Ritter. Collaborating with Sandberg behind-the-scenes from his Lights Out team were production designer Jennifer Spence, editor Michel Aller and composer Benjamin Wallfisch, joined by director of photography Maxime Alexandre (The Other Side of the Door) and costume designer Leah Butler (Paranormal Activity 3 & 4). New Line Cinema presents, an Atomic Monster/Safran Company production, Annabelle: Creation. The film is distributed by Warner Bros. Pictures, a Warner Bros. Entertainment Company. Annabelle: Creation has been rated R by the MPAA for horror violence and terror.